What comes to mind when some one talks about being an amazing “Tour Ambassador”? Did you imagine a very boisterous, and hyperactive youngster or auntie decked with a wild rainbow coloured hat*? Well, it’s hard to appreciate the amount of work and effort that a tour guide puts into their work, so as a proudly home grown Singaporean brand, our recruitment agency hopes to dispel the myth. 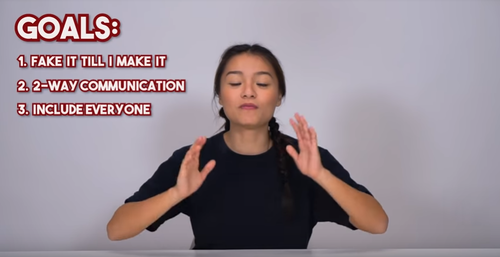 To make things interesting, we decided to invite a bubbly Xenia (@hotcheekylace), from The Smart Local's Hired or Fired series, to experience what it would be like to be work as our Tour Ambassador at Gardens By The Bay. Video below shows a better picture of Xenia, hard at work! Disclaimer: Hat and uniform comes separately. Umbrella hat is Xenia's own. Some of our more seasoned Tour Ambassadors at Gardens By the Bay often carry out guided tours for a group of 5-10 people, with each walk lasting up to 20 minutes. Apart from dishing out fun facts at the group, they are would need to keep their guests entertained and feel comfortable enough to stick with them throughout the length of the tour. After a quick training run down sesh, Xenia was given with a folder filled with all the facts needed about the different seasonal flowers available at Gardens By the Bay. With the help of Debbie, our 1-day amateur guide managed to cramp information of the plants, flowers, and even the holiday decor featured in a short amount of time! Despite popular belief, the human brain is not a supercomputer with the ability to retain a lot of information in one go. Luckily for Xenia, Gardens By the Bay had placed up mini signages with the different names of the flora and fauna to help jolt the memory. If a hardworking Xenia could do it, so can you. If all else fails, just speed walk your way past all the plants you’re unsure of. JK - but... just make sure your supervisor doesn't catch you. *Thinking of working at GBTB as a Tour Ambassador or in something similar? Well, here are some smart-AF hacks from Xenia. Even seasoned hosts get jittery when given such a short amount of time to prep an encyclopedia's worth of must-dos. To get over the nerves, a jumpy Xenia thinks about faking it till you make it - putting on a persona and acting confident even when you feel anxious underneath. Next, having a two-way convo, seeing your tour group like you would your fellow friends. That creates a lighter atmostphere for guests to be engaged and relaxed. A strong customer service professional makes sure to include everyone! So encourage conversation (like Xenia) and throw out some friendly quizzes to help break the ice. See someone losing interest or straying away during the tour? Draw them back in by throwing out a joke or two to keep them entertained. 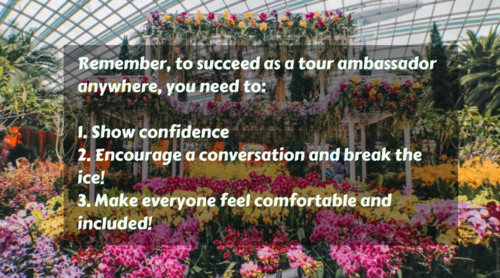 Your job as a Tour Ambassador bears traits of a host. And what do good hosts do to keep people interested? They throw in jokes, fun facts, and relate to people! We’re not going to lie but this sounds like the perfect job for people who love people - extroverts more so. Thankfully, you will not be spending your hours only conducting tours. To male things exciting, Tour Ambassadors may also be assigned shifts at the information counter where you get to be a helpful bone by answering queries of lost or clueless tourist and tourists. There are no textbook perfect answers to what they may ask, but this would be guaranteed to keep you quick-thinking on your feet. As a Tour Ambassador, Xenia spent her next half of the day providing visitors with free maps and brochures that highlight the extra interesting parts of GBTB! Imagine how fun it will be to meet and talk to new people from all over the world! Interested in a career as a Tour Ambassador at some of Singapore’s well-known landmarks and attractions? Drop us your resume or find similar jobs with BGC! Loved this article? We've compiled some of our favourite reads below!